Choglamsar, Shey, Thiksey, Stakna, Karu. I now know the road almost by heart. Going downhill makes things seem much more pleasant. Manzoor catches up with us just after Thiksey with the golden tickets. Noone stops us at the 1st checkpoint. 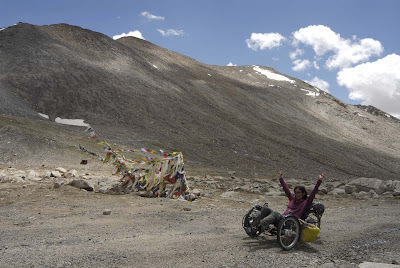 We start climbing the first big pass (Chang La 5360m) and find a not so pleasant camping spot in one of the loops at 4000m. The next day, I still cough and most of all feel absolutely shattered. After 2 hrs I've hardly climbed 200m, there are more than 1000 left, I give up, sorely disappointed, and I accept - for the 1st time - to get on a truck. Feeling of failure, intensified by the long wait for a vehicule that will eventually take on board bike plus pilot. 2 hrs later while I'm still by the side of the road, I see Pierre who's riding back down to see how I was doing (well not so good...). Just then, a police truck agrees to stop at last. We both get on. I sit in the cabin with the driver while Pierre and the bikes are at the rear amidst scrap metal. The road is impressive seen from higher up. The precipice always seems very near... At one point, we see - coming in the opposite direction - another truck carrying the wreck of what must have been in the past - before probably jumping off a cliff - a military vehicule. "Ah, single lane roads" says our driver, laughing and pointing at the smashed wreck. We drive backwards down the road, looking for a wider place where we can pass each other, wheels on the verge, then past the verge... Well I definitely don't share this sense of humour. Ending the trip here, in such an ungraceful way... No, I don't want to think about it! After 20 minutes of hazardous manoeuvring up and down, we eventually drive off again towards the pass. Phew ! We finally reach Chang La ! 5360m according to the Indian road sign, our GPS says 5380m. Who's right? Quick snack at the top. We unload the bikes. Going down is hard work. I feel sore all over my body. 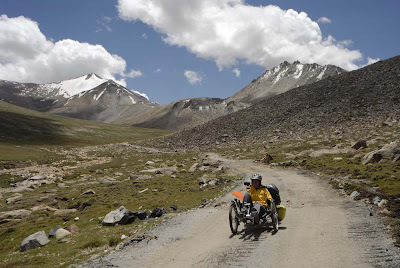 The 35kms to reach Tangste seem to last for ever. We stop at the 1st guesthouse, and I slip under several layers of blankets. shivering with fever. The rest of the trip is promising indeed ! Getting a bit wet, are we ?! Back to Tantse the next day, after a short and troubled night, spent for the most part at the toilets "in the open", my body rejecting the syrup, paracetamol and antibiotics altogether. No comment! Fortunately, the ride is short and kinda downhill (slightly). 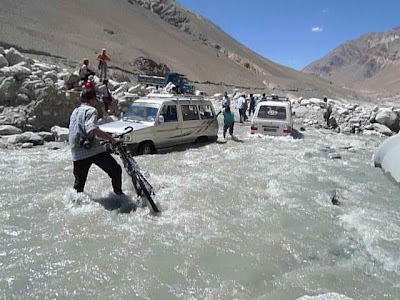 We cross the big river earlier than the day before, which makes things easier, even if several jeeps are already stuck in the middle. We now have to climb back Chang La in the other direction. I've perked up again, and Pierre offers to carry one of my panniers to as to balance strengths. 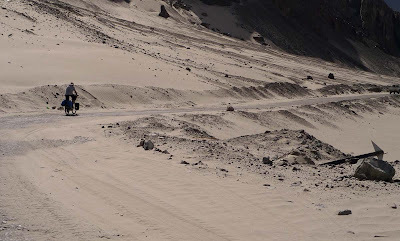 Tarmac is soon replaced by packed mud and gravel, with some serious inclines. 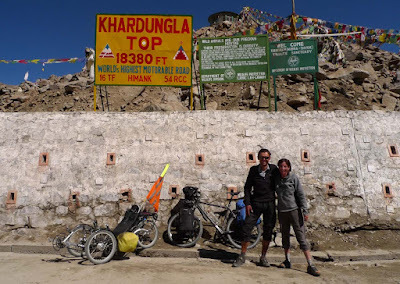 We reach the pass, without the help of a truck this time, but fairly late (almost 6pm). Just the time to swallow a hot tea offered by the military who look after the road, and put on all our warm clothes, we set off for the descent. The night comes early after 7pm, so we opt for the same camping spot as on the way up, and stop just before it gets too dark. 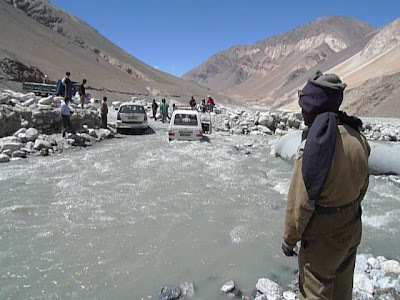 We aren't behind schedule, so that leaves us a couple of days for Wari La. 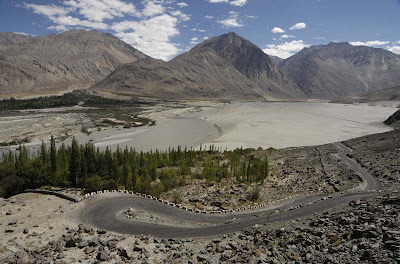 This little-used road leading to Nubra Valley coming from the village of Taktok goes over a 5300m pass. Hard to find any accurate information on the exact altitude, length or slope gradient. 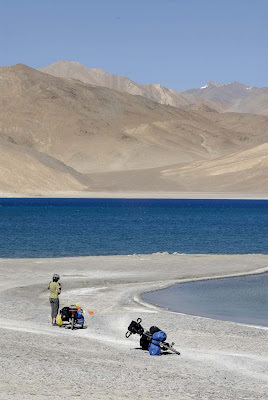 All we know is that it's supposed to be the toughest pass of our itinerary ! 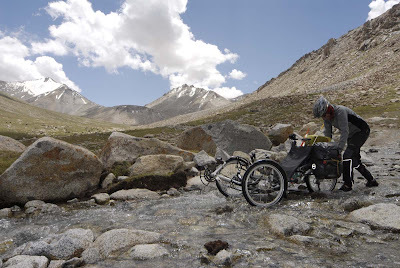 We plan a short day by way of a rest day before climbing the pass strictly speaking. 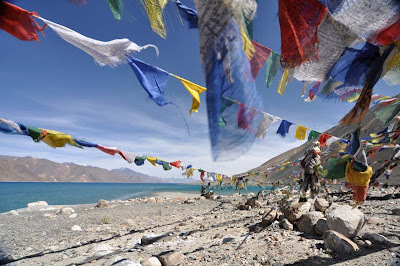 Short break at the Taktok monastery to pick our permits for Nubra Valley (dropped off by Laurent, a French bloke I met in Leh last summer and who spends several months in Laddakh each year). 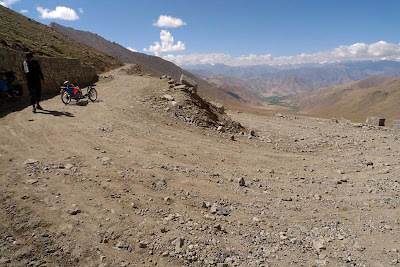 We actually ride more than 4 hrs (on good tarmac) to a camping spot around 4650m (almost 1000m altitude gain today! ), on a small grassy plateau overlooking the valley, with a small river, perfect for the shower and water supply. We get a glimpse of the pass which seems to be close just above us, and the loops leading up there. Hum, well... doesn't quite look like tarmac here, does it !?! Early start for today's 700m ascent. 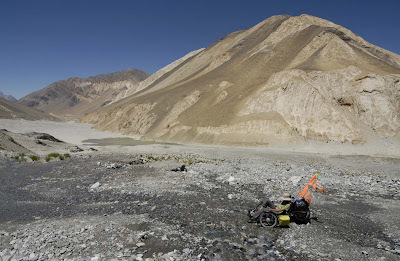 The goal : reach the pass before midday. The gradient and the state of the road will decide otherwise. 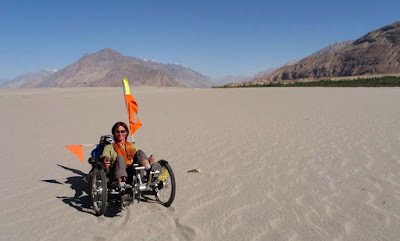 I am forced to get off the trike and push on several occasions, sometimes as long as more than 100m. The end is real hard. I eventually reach the summit around 2pm, tired but very happy. 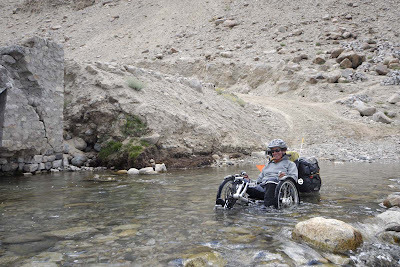 A long descent is awaiting : 60km / 2200m down, with inevitable streams to ford and a few more climbs along the river Shyok. 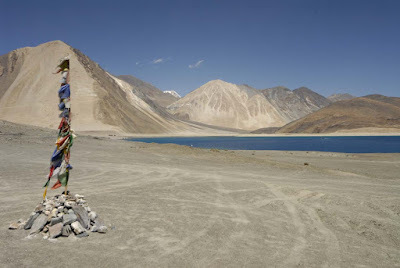 In the village of Khalsar, at the entrance of Nubra Valley, we are greeted as usual by a dozen onlookers. Some enjoy playing with the horn while others try to understand the mechanics of the tricycle. 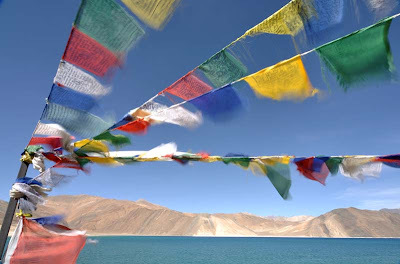 The long sentences in Ladakhi are punctuated by "gears", "steering", "brake". The conclusion is always the same: "First time I see this cycle, very good". Bad luck for us in the evening : there is not a single bottle of beer available in the whole village. 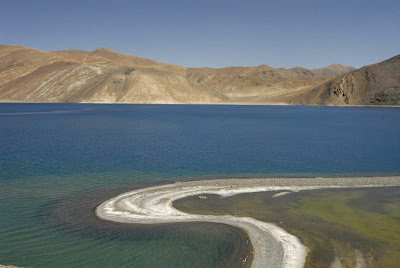 After the multiple "dry days" in Leh, we will be - once more - deprived of a well-deserved aperitif. Short tour in the valley the next day. Pierre goes up to visit the beautiful monastery in Diskit while I take a rest in the village (already seen it last summer). 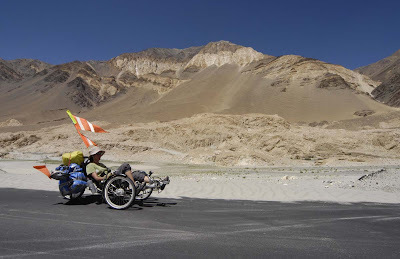 We cycle past the sand dunes near Hunder, and try to see how far we can possibly go towards Pakistan. The answer is quick to come : not very far ! A bridge outside Hunder, guarded by armed military who don't seem to be there for fun, and a sign "Cautious, no visitors allowed beyond this point" deter us from trying to go any further. That's too bad. Break in the sand. 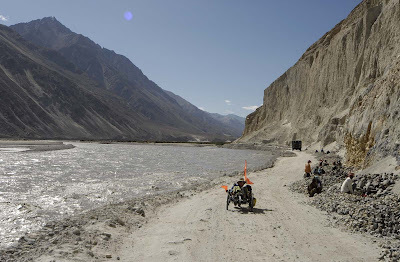 In the background on the right, the Nubra Valley goes up all the way to the Siachen glacier, at the border of Pakistan and China, highest battlefield in the world. 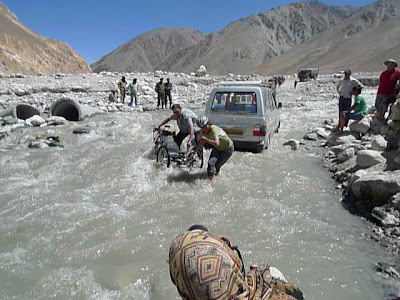 On the left, the Shyok river flows down to the lower plains of Pakistan. 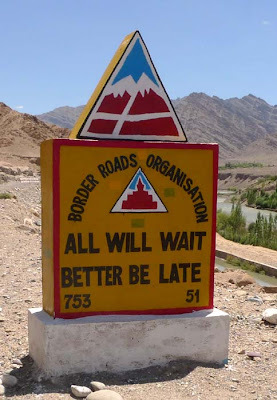 It's now time to get back to Leh. 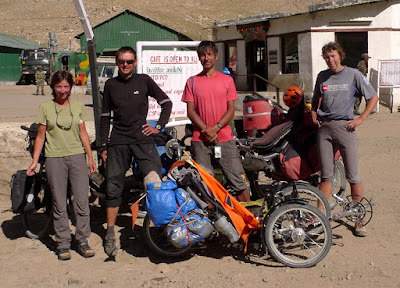 We decide to give ourselves 2 days to cover the distance of 120kms and the 2200m climb. 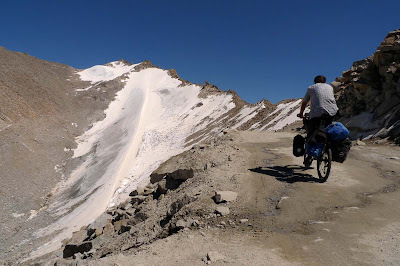 On the road to Khardung La, the last pass of the series, a jeep with Indian tourists coming in the other direction stops by: "Two French people coming this way. Cycles same same like yours but a bit different. Two wheels". 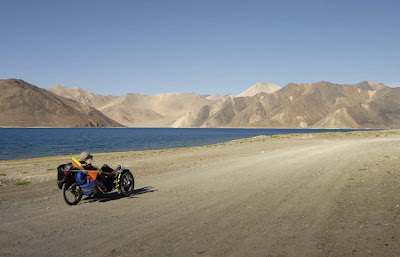 Hum, we look forward to meeting those 2 Frenchies who ride reccumbents on Ladakh's roads. 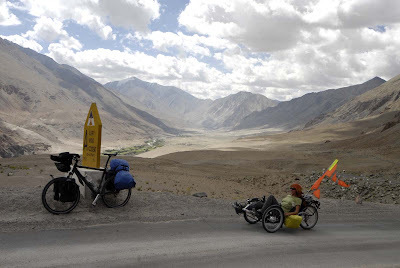 In the Nubra Valley, they're really gonna think French people have funny bicycles. 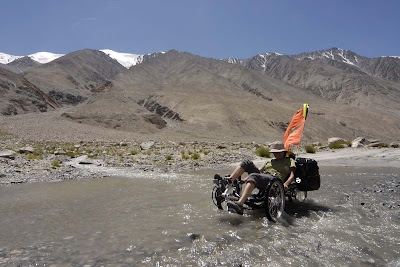 Camping around 4300m by a river above Khardung village. What a surprise early in the morning, while we stick our heads out of the tent to check on the weather : we see - hardly 100m away - a wolf. No time to take out the camera, it's already gone far in the mountain. It's the 2nd time we've seen one (the 1st time was when we camped in the Sarchu Plains just down Baralacha La). This is quite surprising so close to the roads which are - to some extent - fairly used, and only a few kms away from houses. We start off again towards the pass. 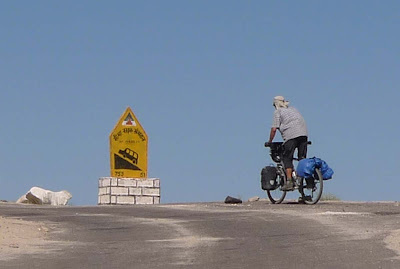 The last few kms seem amazingly easy (well it's true that Pierre still carries one of my panniers on the long cimbs). Nothing to do with Wari La or Chang La. It's so much easier (and the road is so much better!). We get there for lunch time. 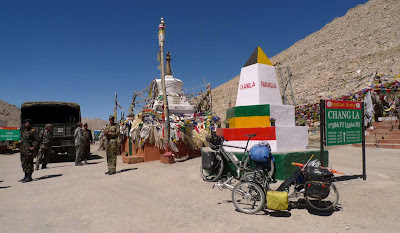 Traditionnal picture under the sign "highest motorable road in the world", this time with loaded bikes. A hot tea and a piece of Lindt dark chocolate with almonds, and we're ready to go racing downhill ! 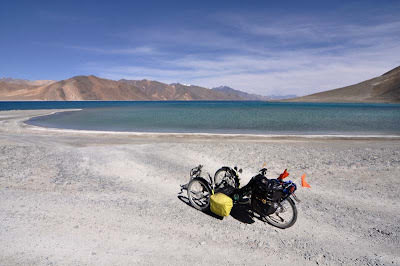 40km non-stop to Leh (including 30K of good paved road), a real treat. Nice reward after all the efforts of the previous days! just chanced upon your blog and must say, was a good thing to happen to me. The pics are great as is your narration. 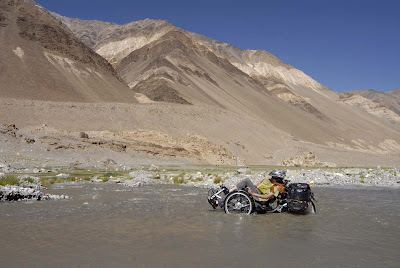 I'm from India and have been planning a trip of this area....of course, will take the more traditional mode of transportation. Best of luckk for future journeys and hope you come back to India again...bon voyage!! !